Dollar General Weekly Ad for This Week offers Xtra liquid laundry detergent 80-96 load/144-150 oz. Powercore 14 ct. Bounty paper towels 3 big rolls, Angel soft bath tissue 16 large rolls. AmeriGas cylinder Exchange 15 lb. Cheetos 8-9 oz. or fritos 9.25-9.75 oz. Assorted varieties. Get DG home soft bath tissue 32 double rolls, Trueliving metal bakewater, Glad trash bags 13, 30 or 33 gallon. 30 gallon tote, Folding table 6 ft. Hanes Men's color crew or pocket T-Shirts sizes M-2XL. See Household essentials including Gain liquid laundry detergent 19-25 load/40 oz. Fireworks scent booster 9.7 oz., fabric softener sheets 105 ct., Ultra liquid fabric softener 48 load/41 oz. or non-concentrated fabric softener 61 load/100 oz. Tide pods 23-31 ct. or gain flings! 31 ct. Charmin essentials soft bath tissue 12 double rolls or bounty paper towels absorbent 6 rolls or basic 6 big rolls. DG home concentrated bleach 121 oz. assorted scents, DG Home trash bags 13 gallon/15 ct., 39 gallon/12 ct., flap tie 13 gallon/50 ct., 30 gallon/25 ct., flex 13 gallon/25 ct. or 30 gallon/15 ct.
Clover Valley bottled water 24 pk./16.9 oz. ea. Lipton tea bags 24 ct. or southern sweet tea 22 ct.
Hawaiian punch 1 gallon or v 8 splash 64 oz. or smoothie 46 oz. assorted varieties. Affordable Baby needs! 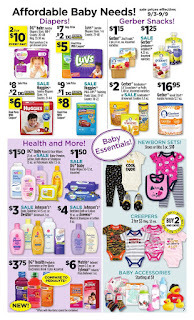 Get DG baby hand & face wipes 25 ct. or baby powder lotion, bath wash or shampoo 15 oz. or petrolium jelly 7.5 oz. DG baby wipes 56-72 ct., DG jumbo diapers sizes: NB-7 count: 20-48, Luvs jumbo diapers sizes 1-6 counts: 21-48, Huggies jumbo diapers sizes: 1-6 counts: 21-44, Huggies pull-ups training pants sizes 3T-5T counts: 18-22. This Ad may contain time-sensitive information and offers. 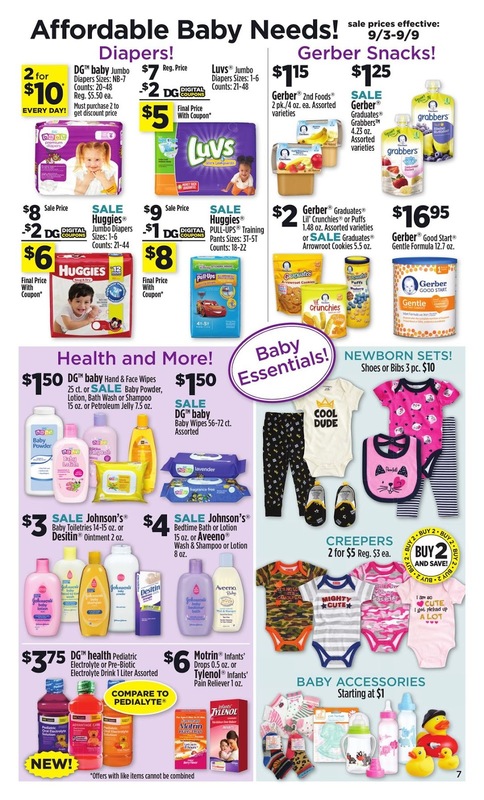 Always check this page for the new posts about the latest Dollar General weekly ad circular & deals.